Making pierogi is considered a chore by some and a therapeutic activity by others. I belong to the latter category as you may have guessed. I love to experiment with both fillings and the dough, but I also love the familiarity of the act itself. It takes me back to the minuscule kitchen of my Babcia Ziuta (my mum’s mum who passed away a few years ago) as a child. When we made them yesterday, I felt like the process of “sticking them together” (as you would translate literally from Polish) was healing for mum and me. We don’t have a nice, old, English mother-daughter relationship (this is a stereotype of course, but from my observations the English do manage to keep this relationship “nice” on the whole). A Polish mother-daughter relationship is a rather different animal – intense and difficult at times. Sometimes it’s impossible to find the words to heal us after a rift. 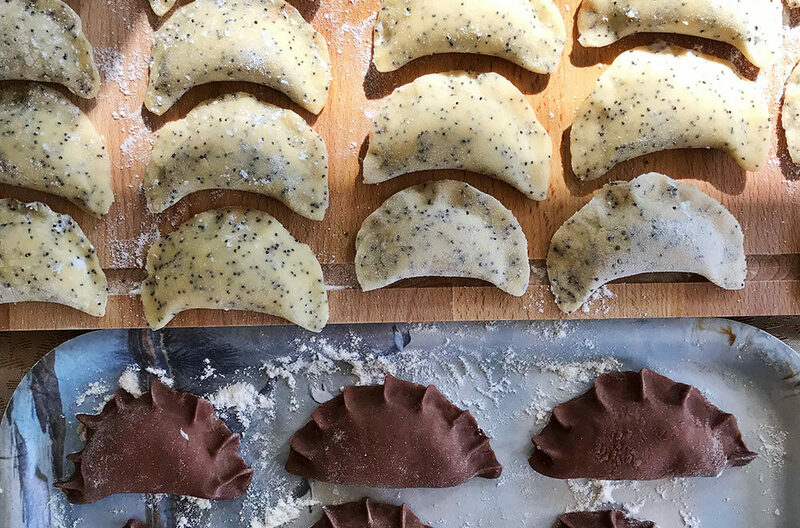 Making pierogi helped – there’s something warm and ancient about it, something the surpasses daily unkindness and reaches the core of the being, wrapping it up in a warm, doughy quilt. Combine the ingredients for the dough and kneed for at least 10min until you get a lovely, elastic dough ball, which is a pleasure to kneed. Divide this dough ball into two and add the cocoa to one half and the poppy seeds to the other, working them both into the dough for another 5min or so. Stick these into the fridge whole you make the fillings. For both the fillings you want to squish the twaróg with a fork, along with the egg, soured cream and vanilla sugar. Then we add the prunes and honey to one of the fillings and the almond essence, honey and prunes to the other. Roll the dough out as thin as you can on a floured work surface and cut circles out of it with a glass. Take each circle and press and stretch it a little before you put the filling on it. Put a teaspoon of filling inside each stretched circle and fold into a half moon shape. Once you have sealed each half moon, you can experiment with different patterns on the edges if you wish. Place all your pierogi on a floured surface then either freeze or cook in a pan of lightly salted water, until they float to the top. Then give them 2min more. Drain and serve with a dollop of soured cream and a drizzle of good honey or maple syrup. It felt like we’d made about a million of these pierogi and by the end I was done done. Amelka, who is 9, didn’t seem to want to stop. She enjoyed the process immensely, chattering away about people we know and those we don’t in equal detail, while experimenting with unusual pierogi shapes. When D woke up from her nap, she helped us for an hour too, rolling the dough out with her miniature rolling pin and cutting shapes out of it. She loves the pierogi process too and gets very offended if she can’t help (when I’m in a rush). I hope that as a mother I can be both a little bit Polish and a little bit English, with a whole lot of Wild Woman thrown in for good measure. That way we won’t need pierogi therapy too often. We shall make them anyway, of course, both for the pleasure of the process and of the eating.